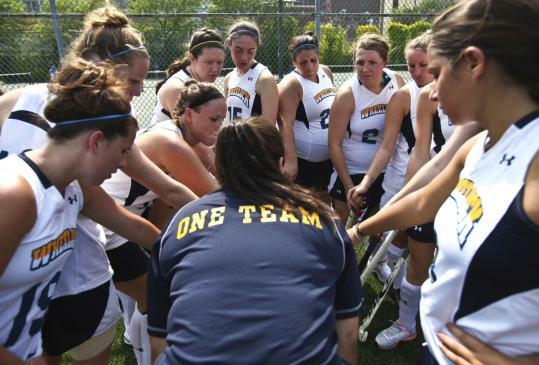 At just about any other place on this sports-crazed planet, the 3-1 loss suffered by the Wheelock College women’s field hockey team in its first home game of 2011 would have been cause for hung heads, slumped shoulders, and a grumpy locker room. But in the alternate universe that is Wheelock, the Lady Wildcats left the field with smiles and attagirls all around. “We improved! Last year we would never have scored on them,’’ said junior striker Despina Savvoulides, the game’s lone scorer. Thus the Wheelock athletic department philosophy: Winning doesn’t matter. Improvement, enjoyment, character, and team building do. Seriously. At Wheelock, a 1,055-student campus in Boston’s Fenway neighborhood with no gymnasiums or sports fields of its own, that philosophy approaches religion. And it is attracting attention from other college sports executives unhappy with the win-at-all-costs attitude believed to drive some corruption-plagued programs. The philosophy has, ironically, proved successful in another way: With it, the school has started winning games. Athletic director Diana Cutaia brought the philosophy to campus six years ago, and since then the athletic department’s collective record has gone from 45 athletes with three wins the prior season to 122 athletes and 40 wins last year. Indeed, Cutaia, a youthful 38-year-old with hipper version of Buddy Holly’s glasses and blond-streaked hair, has been a winner much of her sporting career. She was a standout point guard for Greenwich (Conn.) High School in the late 1980s, followed by a solid year at Sacred Heart University. Even though her college playing career was cut short by knee injuries, Cutaia continued winning as a coach - first by leading Norwalk Community College’s women’s hoops team to three New England division titles along with national ranking as the No. 8 program in its division, then by helping pull Curry College’s women’s team out of the cellar, and finally, pre-Wheelock, by helping guide Mount Holyoke College’s women’s team to consecutive winning records. If Cutaia’s philosophy stopped with “winning doesn’t matter’’ it would still be enough to keep college sports abuzz for years. But it is broader. It includes a policy of no punitive reactions by coaches against athletes who mess up, and a requirement that all athletes spend at least some of their scant spare time volunteering as ticket takers, ushers, and cheerleaders at other athletes’ games. The most important assessment of Cutaia’s philosophy may not be what peers think but how her athletes feel and how they fare. “I won’t lie. I thought it was weird when I first got here,’’ says Savvoulides, who scored a SportsCenter-worthy goal in the season-opener’s 65th minute. Alexandra Chiesa, 21 and a senior soccer player, took it a step further, explaining that embracing Cutaia’s philosophy hasn’t made her less passionate about sport. When Cutaia first took over as athletic director, her ideas surprised John Preziosa, head coach of the men’s basketball team. But he admits that they quickly grew on him. Del Malloy, commissioner of the New England Collegiate Conference, to which Wheelock belongs, says he’s heard from other sports executives that Cutaia’s philosophy is stirring interest. Jim Thompson, executive director and founder of the Positive Coaching Alliance, a nonprofit foundation cofounded by Stanford University’s Athletic Department in 1998, is both fan and critic. Thompson, who spent a decade as director of the Public and Global Management programs in Stanford’s Graduate School of Business, says desire to win can motivate if it is done in a positive atmosphere. Cutaia’s Wheelock programs have been a topic of conversation among college sports executives, says Stephanie Thorburn, associate director of leadership development for the NCAA. What Cutaia and Wheelock are doing is a model that reflects a national mentality, according to Ken Reed, executive director of activist Ralph Nader’s nonprofit League of Fans sports research foundation. “There is statistical and anecdotal evidence that those are the athletes who win more often and mature with such self confidence that they’re not crushed and unable to progress if they lose a game or even an entire season,’’ Reed says. During a recent Wednesday morning soccer practice, a freshman player either missed or ignored a coach’s instruction and kicked the ball in the wrong direction, an error that could have been costly in a real game. The young woman stopped in her tracks, and looked around, waiting for the “normal’’ scolding and punishment of extra sprints. Instead, several senior players sprinted to the girl, gave her rough, one-armed hugs, patted her on the back, and began shouting admonitions to her. Keep your head up! It’s all good. Don’t worry about it. That’s what practice is for. Shake it off. Let’s go, Wildcats! James H. Burnett III can be reached at james.burnett@globe.com. Follow him at www.twitter.com/jamesburnett.